I. Introduction. Relative Lack of Media Focus on the Danger of Appointing the Exxon CEO to be US Secretary of State Given the Enormity of the Climate Change Threat. How should those who are concerned about the enormous threat of climate change respond to the Trump nomination of Exxon CEO Rex Tillerson to be the US Secretary of State given the enormous damage that Exxon has already caused through the company’s successful efforts in delaying the adoption of US climate change policies? Trump’s selection of Tillerson for Secretary of State has received considerable understandable attention from the US media largely because of concern about Exxon’s ties to Russia, including, for instance, a contract with Russia negotiated by Tillerson in the amount of $500 billion that can’t be executed until economic sanctions placed on Russia for its invasion of the Ukraine are lifted. Given the potential meddling of Russia in the recent US presidential election and potential conflicts between Russia’s and US interests, appointing someone to be the lead US foreign policy administrator who is the chief executive of a company with such close ties to Russia creates reason for obvious concerns about the ability of the Secretary of State to manage foreign policy so as to protect US interests while ignoring the interests of the world’s largest publicly traded oil and gas company which are sometimes in conflict with American goals. Conflicts between Exxon’s interests and US foreign policy interests are likely to frequently arise in the Trump administration. For instance, it is in the US interest to keep the price of fossil fuel very low but not in the interest of a fossil fuel company, nor Russia for that matter, both of which could benefit from high fossil fuel prices. Receiving considerable less attention from the US media is the propriety of appointing someone to be US Secretary of State who has been the chief executive of Exxon, a company with a well documented hostility to government policies on climate change. This hostility has not only manifested itself in Exxon’s spending of many millions of dollars in lobbying efforts to oppose proposed US domestic policies on climate change and supporting politicians who have consistently opposed proposed US climate change policies but also, even more disconcerting, Exxon has funded organizations who have been actively fighting to stop the United States from adopting climate change policies by employing morally reprehensible tactics to undermine citizens’ understanding of the scientific basis for the need to aggressively respond to climate change. As we have explained, on this website in considerable detail (see articles under disinformation campaign in the index), although scientific skepticism is good because skepticism is the oxygen of science, Exxon has funded organizations engaged in disinformation who have used utterly indefensible tactics including: (1) lying or reckless disregard for the truth about climate change science, (2) manufacturing false scientific claims about climate change by holding bogus scientific conferences at which participants have made scientific claims that have never not been subjected to peer review, (3) supporting front groups and fake grass roots organizations to oppose climate change policies whose creation was designed to hide the real parties in interest, (4) cherry-picking mainstream climate science by emphasizing a few minor issues in climate science about which there is some scientific uncertainty while ignoring the huge body of climate change science which is undisputed and claiming the uncertainties undermine the entire body of mainstream climate science, and (5) funding public relations strategies to undermine US citizens confidence in mainstream climate science, and (6) cyber bullying mainstream climate scientists and journalist who report on growing climate change risk. Fossil fuel company support of the climate change disinformation campaign has been responsible for at least a twenty-five year delay in the United States response to climate change, a delay which has also thwarted international efforts to achieve a global solution to climate change and has made the threat of climate change now extraordinarily dangerous and made the warming limit goals agreed to by the world in Paris in 2015 to as close as possible 1.5 degrees C but no more than 2 degrees C extraordinarily difficult to achieve. And so, the chief executive of a company has been nominated to lead the development of US foreign policy including forging an international position on climate change which company is already responsible for enormous potential climate change caused harms to the world created by the delay which is attributable to their funding and that of several other fossil fuel companies, industry organizations, and free-market fundamentalist foundations. Although entities other than Exxon have also contributed to the funding of the climate change disinformation campaign, a recent paper published in the Proceedings of the National Academies of Science (PNAS) in October concluded that the main organizations comprising the climate denial echo chamber were funded by ExxonMobil and Koch Family Foundation and produced misinformation that effectively polluted mainstream media coverage of climate science and polarized the climate policy debate. The study is: Corporate funding and ideological polarization about climate change, October 12, 2015. This study’s analysis of 20 years’ worth of communication data between participants in the climate change counter-movement by Yale University researcher Dr. Justin Farrell shows beyond doubt that Exxon and the Koch Family Foundations have been key actors who funded the climate disinformation campaign and ensured the prolific spread of their doubt products throughout our mainstream media and public discourse about climate change. As we have explained on this website, the tactics deployed by the climate change disinformation campaign funded by some fossil fuel companies including Exxon and others should be understood as a new kind of crime against humanity because they are deeply morally reprehensible even if not classifiable as a crime under existing law because of the enormous climate change harms these tactics have caused to tens of millions of poor vulnerable people around the world, some of which are already occurring as others are already in the pipeline. Yet, rather than making Exxon responsible for the enormous damage it has done through its successful efforts to prevent government policies to reduce GHG emissions., President-elect Trump has nominated Exxon’s CEO to be the spokesperson for US foreign policy including climate change foreign policy. This is arguably like appointing the CEO of Philip Morris to be the Surgeon General of the United States. II. Why Has the US Media Given Little Attention About the Danger from Climate Change of Making the Exxon CEO US Secretary of State? Why has the US press mostly ignored the extreme danger of making the CEO of a huge powerful oil company Secretary of State which company has been responsible for dangerous delays in responding to climate change through the use of morally reprehensible tactics and which company’s profits are greatly threatened by policies that rapidly reduce GHG emissions? In fact, some recent press coverage of Tillerson’s nomination to be the US Secretary of State have uncritically portrayed the Exxon CEO as a climate change advocate. And so it would appear that Exxon’s and Tillerson’s recent stated changes in their positions on the acceptance of climate change science is responsible to the US media’s largely uncritical coverage of Tillerson’s nomination despite Exxon’s role in successfully undermining US responses to climate change and the basic conflict that exists between rapidly reducing GHG emissions and Exxon’s profits and the value of its oil reserves. In what is likely an attempt to rebrand Exxon from being a climate change policy obstructionist, recently Exxon has produced TV commercials in which the company announces that is supporting the development of carbon capture and storage technologies that would reduce carbon emissions into the atmosphere. III. 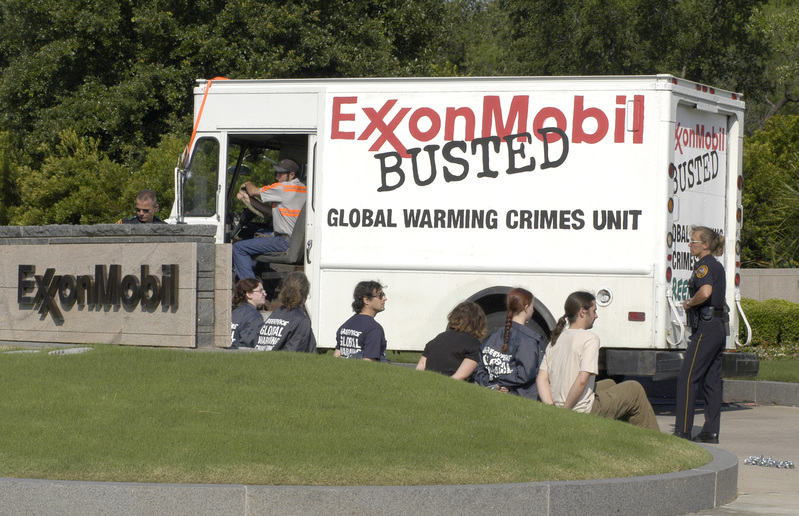 Has Exxon actually stopped funding climate denial organizations? According to a recent article in the Guardian, Exxon gave more than $2.3 million to members of Congress and a corporate lobbying group that deny climate change and block efforts to fight climate change – eight years after pledging to stop its funding of climate denial. IV Has Exxon and Tillerson Actually Become Advocates of Government Action On Climate Change. Does Exxon and Tillerson fully accept the mainstream peer-reviewed science on climate change? It is not clear. Although both Exxon and Tillerson have asserted that they agree with the mainstream scientific view that human-induced climate change is a significant threat that must be dealt with, it is not clear that either accepts the scientific implications of the mainstream view including, for instance, neither that some fossil fuels must be left in the ground unless carbon capture and storage technology can be made affordable and proven effective nor that there is an urgent need to immediately aggressively reduce GHG emissions if the the international community hopes to prevent dangerous climate change. .
Tillerson has stated that he believes that climate change is a problem with an engineering solution. This suggests he supports the development of technologies that can either store carbon in the ground or remove carbon from the atmosphere. Yet no such technologies have been yet identified that can be deployed at the scale currently needed and that are also affordable and technologically effective despite the fact that these technologies are needed to justify continued use of oil and gas at current rates. In addition, and perhaps more importantly, to limit warming to the warming limit goals agreed to in Paris in 2015 of as close as possible to 1.5 degrees C, the world must reduce carbon emissions to net zero by 2050. If nations quickly respond to the obligation to begin reducing GHG emissions to achieve zero emissions by 2050, this will require rapid expansion of non-fossil energy, a possibility due to recent rapid reductions in the cost of solar energy, and require energy companies to hold fossil fuel reserves in the ground. This could leave energy companies with unprofitable reserves, or assets “stranded” underground unless carbon capture and storage or atmospheric carbon removal technologies are deployed at scale because they have become affordable and technically effective. Yet carbon storage has not yet proven affordable nor effective at the scale that would be required to prevent dangerous atmospheric GHG concentrations from continuing to rise. Exxon has not accepted this idea. In 2014, shareholders seeking greater accountability from the company on the potential that some of its reserves would have to be left in the ground submitted a resolution to disclose how its reserves would be affected if climate action reduced demand. The company, in response, produced a report that said it would be “highly unlikely” that countries would enact action aggressive enough to affect demand. Two years later, the world’s nations agreed to the Paris climate agreement to reduce emissions to zero by late in this century. Has Tillerson questioned or denied mainstream climate science since 2006? Yes. In settings with stock analysts or other executives Tillerson has at times reverted back to Exxon’s old narrative that cast doubt on climate science. At the company’s 2013 annual shareholder meeting, for instance,Tillerson said: “Notwithstanding all the advancements that have been made in gathering more data, instrumenting the planet so that we understand how climate conditions on the planet are changing, notwithstanding all that data, our ability to project with any degree of certainty the future is continuing to be very limited….If you examine the temperature record of the last decade, it really hadn’t changed.” Thus Tillerson adopted the frequently discredited claim of many climate change deniers that global rises in temperatures paused in the last decade. For these reasons, it is not clear that Exxon or Tillerson are willing to support US government responses on climate change that are now urgently required to deal with the climate emergency facing the world. V. What Should Those Who Are Concerned Abouaret Climate Change Do In Response to the Tillerson Nomination. Do you support development and deployment of non-fossil energy in the United States as rapidly as possible until technologies which can sequester carbon or remove carbon from the atmosphere have been demonstrated to be economically feasible and technically effective? If you agree that the United States should respond to climate change by putting a price on carbon, will you immediately support legislation which creates a price on carbon at levels necessary to reduce US emissions to the US fair share of safe global emissions? Do you agree that US policy on climate change should seek to achieve the Paris Agreement’s warming limit goals of preventing warming from exceeding as close as possible to 1.5 degrees C but no greater than 2.0 degrees C above pre-industrial levels? If you agree that US climate policy should seek to limit warming to between 1.5 degrees C and 2.0 degrees C, do you agree that the US should clearly explain how its policies will achieve these warming limit goals of the Paris agreement? Since you agree that human-induced climate change is a threat to people and ecological systems around the world, do you agree that Exxon should no longer fund the campaigns of politicians that deny that human-induced climate change is a threat worthy of a strong national response? Since GHG emissions from the United States not only threaten US citizens and ecological systems but people and ecological systems around the world, do you agree that US policy on climate change should respond to the US responsibility to prevent climate change from harming all people and ecological systems around the world? Do you agree that people and nations who could be harmed by high levels of US GHG emissions from the United States have interests in US climate change policies and if so their interests should be considered in formulating US climate policy? Do you agree that nations that emit GHGs at levels beyond their fair share of safe global emissions have a duty to help pay for reasonable adaptation needs and unavoidable damages of low-emitting countries and individuals that have done little to cause climate change? If you disagree that high emitting nations have responsibility to help finance reasonable adaptation needs or unavoidable damages from climate change in countries which are largely not responsible for climate change, how do you interpret the “polluter pays” principle of international law? Do you deny that when the US formulates a GHG emissions reduction target it has a duty both under the United Nations Framework Convention on Climate Change (UNFCCC) which it ratified in 1992 and the Paris Agreement to formulate its commitment after consideration of what “equity” requires of the United States and if so what does the term ‘equity” under the UNFCCC mean to you? 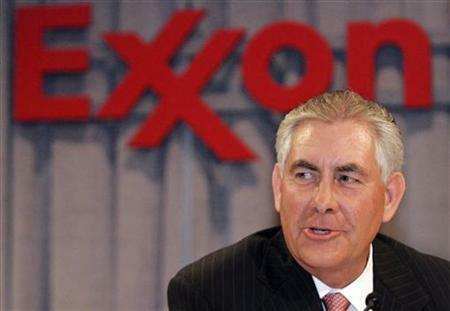 Exxon changed its position at about the time that Rex Tillerson became the CEO of Exxon. This is the second in a three part video series on why the climate change disinformation campaign is so utterly ethically offensive. The fist video in this series looked at the how the campaign was responsible for allowing greenhouse gas atmospheric concentrations to rise from 320 ppm when warnings of the harsh impacts of climate change were articulated in the scientific community in the 1960s to 395 ppm now. This series distinguishes between scientific skepticism which is good and should be encouraged from the tactics of the disinformation campaign which are shown to be ethically odious. This second video in the series looks at several of the tactics of the disinformation campaign in more depth and contrasts them with responsible skepticism. The World Waits In Vain For US Ethical Climate Change Leadership As the World Warms. Although some progress was made on a number of procedural issues and voluntary emissions reductions commitments at the conclusion of the 16th Conference of the Parties (COP-16) to the United Nations Framework Convention on Climate Change (UNFCCC) meeting in December, the international community had failed for the 20th year in a row to agree to a meaningful global approach to climate change. That is, Cancun failed to produce binding and equitable national greenhouse gas emissions reduction targets necessary to prevent dangerous climate change nor dedicated and predictable funding needed for adaptation by vulnerable developing nations. In fact, the voluntary emissions reduction commitments agreed to in Cancun, even if fully complied with, virtually guarantee that rising global temperatures will exceed dangerous levels. Although there are several countries that have frequently failed to respond to what justice would require of them to reduce the threat of climate change, the United States, more than any other country, has consistently failed to respond to its ethical duties to reduce its emissions to the its fair share of safe global emissions during the over two decades that world has been seeking a global agreement on how to respond to climate change. In fact, as we shall see, the United States among the developed countries is the only nation to make no binding commitments on climate change. Because the United States is such a vital player in any global solution to climate change, the United States response to its obligations to reduce the global threat of climate change has been an immense impediment to an urgently needed global climate change solution. And so the world continues to wait for ethical leadership from the United States on climate change as significant damages from human-induced climate change now are becoming more visible around the world. And so, as the world is running out of time to prevent significant climate change, the United States is ignoring its global obligations. Even though the election of President Obama was widely seen as a basis for hope in the international community that the United States would for the first time accept its international responsibilities on climate change, it would appear that at least for his first term President Obama will not be able to deliver on his promise to make the United States a responsible participant in solving climate change. Because the United States recently elected a Congress that shows no interest in developing national climate change policies and there are reasons to believe that the Obama administration will not be able to make meaningful reductions through administrative action under existing law, the international community is becoming increasingly pessimistic that it will be able to achieve a global deal on climate change in the continuing absence of US leadership. The international community needs the United States to commit to reduce its emissions not only because of the relative size of the US emissions as a percentage of global emissions (over 21%), but because other countries have signaled that they will not act without the United States greenhouse gas reduction commitments. This post reviews: (a) the state of international climate change cooperation in light of COP-16 in Cancun, (b) the unfortunate and tragic history of the failed US response to climate change, (c) the political domestic opposition to climate change policies, and (d) the need of the United States to respond to its ethical duties to reduce the threat of climate change. To understand the state of the global deal on climate change, one needs to examine the agreements reached at COP-16 in Cancun. In a recent post, ClimateEthics examined in considerable detail the positive outcomes and huge disappointments of COP-16 in Cancun, Mexico in December 2010. See, An Ethical Analysis of the Cancun Climate Negotiations Outcome. In summary, despite a few agreements on mostly procedural matters and non-binding national emissions reductions commitments and aspirations for adaptation funding that have kept hope alive for some eventual global deal on climate change, the Cancun agreements failed to achieve legally binding agreements on national greenhouse gas emissions reductions and sufficient dedicated funding for adaptation efforts to climate change in vulnerable countries around the world. Although Cancun made progress on voluntary national greenhouse gas emissions reductions commitments, these commitments even if complied with, will not avoid dangerous climate change. In short, Cancun made some progress but deferred decisions on the most difficult international climate change issues to later COPs. As we explained in the previous post, Cancun utterly failed to achieve an agreement that: (a) was environmentally sufficient, (b) adequately funded needed adaptation, or (c) allocated national responsibility on the basis of equity. As we have seen the Cancun agreements fail to modify the inadequate voluntary commitments on ghg emissions reductions made pursuant to the Copenhagen Accord. Not only does the Cancun agreements fail to require sufficient ghg emissions reductions to assure that the international community is on a ghg emissions reduction pathway that will prevent dangerous climate change, the emissions reductions commitments that have been identified under the Cancun agreements almost guarantee that millions of poor people, plants, animals, an ecosystems will be harmed by climate change. That is, the voluntary emissions reduction commitments made in Cancun leave at a very minimum a 5Gt gap between emissions levels that will be achieved if there is full compliance with the voluntary emissions reductions and what is necessary to prevent 2°C rise, a warming amount that most scientists believe could cause very dangerous climate change. As we explained in the recent post on Cancun, a third criteria that all post-Kyoto proposals must meet is the requirement that national emissions reduction proposals must be consistent with what “equity” and “justice” demands of nations. That is, equity requires that each nation reduce its emissions to its fair share of safe global emissions. In other words, each nation’s emissions reduction levels should be based upon what distributive and retributive justice demands, not on national self-interest. As we explained in the recent post, the voluntary emissions reductions commitments made under the Cancun agreements utterly failed to satisfy the requirement that national emissions reductions be based upon “equity” or are otherwise distributively just. An Ethical Analysis of the Cancun Climate Negotiations Outcome. Two dramatically conflicting headlines about the outcome of the recently concluded Cancun United Nations Framework Convention On Climate Change’s 16th Conference of the Parties (COP) are initially defensible. One might be: Nations At Cancun Tragically Fail to Make Meaningful Commitments on Climate Change for the Twentieth Year In A Row Another might be: Cancun Surprises Many By Keeping Hope Alive for A Global Climate Change Deal. This post looks at these conflicting conclusions about Cancun through an ethical lens. This post will explain that although some hope for a global solution to climate change is still alive due to decisions adopted in Cancun, one must see Cancun in the context of a twenty-year failed attempt to prevent dangerous climate change. From that standpoint Cancun must be seen as another troubling ethical failure of those most responsible for climate change. This is a tragedy because each year when there has been a failure to commit to adequately reduce greenhouse gas (ghg) emissions has made it more difficult in subsequent years to get on a ghg emissions reduction pathway capable of preventing serious climate change. For some, the modest progress in Cancun toward a global approach to climate change has been seen as a positive step forward. (BBC, 2010). This is so because many thought that the UNFCCC architecture for a global solution to climate change was in jeopardy of completely unraveling before Cancun; a legal structure that had been gradually been put into place since 1990 when negotiations on a global solution to climate change began. Yet, this post will argue that Cancun must be seen in the context of what has failed to happen in the last twenty years on climate change and not only on the basis of the very limited positive steps made in Cancun. We must see climate change as an ethical problem because: (a) it is a problem caused by some people in one part of the world that puts others and the natural resources on which they depend at great risk, (b) the harms to these other people are not mere inconveniences but in some cases catastrophic losses of life or the ability to sustain life, and (c) those who are vulnerable to climate change cant petition their governments to act to protect themselves but must rely upon a hope that a sense of justice and responsibility of those causing the problem will motivate them to change their behavior. Because climate change raises civilization challenging ethical questions, any proposed climate change regime must be examined through an ethical lens. This post reviews the Cancun outcome through an ethical lens in light of the overall responsibility of those nations that are exceeding their fair share of safe global emissions in regard to their duties: (a) to reduce greenhouse gas emissions to levels necessary to prevent harm to others, (b) to reduce greenhouse gas emission to levels consistent with what is each nation’s fair share of total global emissions, and (c) to provide financing for adaptation measures and other necessary responses to climate change harms for those who are most vulnerable and least responsible for climate change. To understand the significance of what happened in Cancun, it is necessary to briefly review the history of international negotiations leading up to Cancun. That is, it is not sufficient to simply examine what happened in Cancun without seeing Cancun in the context of the twenty-year negotiating history whose goal has been the prevention of dangerous climate change and the harms that each year of delay in agreeing to a global deal exacerbate. The Cancun conference took place from November 29 to December 10, 2010. The Cancun goals were modest in light of the failure of COP-15 in Copenhagen the year before to achieve an expected global solution to climate change. Copenhagen was expected to produce a global solution to climate change pursuant to a two-year negotiating process and agenda that was agreed to in Bali, Indonesia, in December 2007. To understand the ethical significance of the Cancun Agreements, it is necessary to review the twenty-year history of climate change negotiations that led to Bali, Copenhagen, and Cancun. This history constitutes a failed attempt over two decades to adopt a global solution to climate change. The UNFCCC has 192 parties, a number that includes almost all countries in the world including the United States which ratified the UNFCCC in 1993. The UNFCC is a “framework” convention because it has always been expected that additional requirements would be added to the initial framework in updates that are known as “protocols” or in annual decisions of the conferences of the parties (COPs). • 2010 – COP 16, Cancun. Each year nations have meet in COPs to achieve a global solution to climate change and each COP for the most part continued to add small steps toward the goals of the UNFCCC. Yet in all COPs some nations have resisted calls from some of the most vulnerable nations to adopt a solution to climate change that would prevent dangerous climate change. As the international community approached Cancun, no comprehensive global solution had been agreed to despite the fact that the original negotiations on the UNFCCC began in 1990 with a goal of achieving a global climate change solution. For this reason, Cancun must be understood as the latest attempt in a twenty-year history of mostly failed attempts to structure a global solution to climate change. The first major addition to the UNFCCC was the Kyoto Protocol which was negotiated in 1997 because the international community had been convinced by then by the emerging climate change science that developed nations needed to be bound by numerical emissions reductions targets. The Kyoto Protocol entered into force on February 16, 2005 and currently has 190 parties. The United States is the only developed country that never ratified the Kyoto Protocol. Under the Kyoto Protocol, the developed countries agreed to reduce their overall emissions of six greenhouse gases by an average of 5.2% below 1990 levels between 2008-2012. The developing countries had no binding emissions reductions obligations under Kyoto. The Copenhagen negotiations in 2009 were necessary not only to expand the modest commitments made in the Kyoto Protocol but also because the emissions reductions obligations of developed countries set out in the Kyoto Protocol expire in 2012. Kyoto was never understood as the final solution to climate change but only as a small initial step of developed nations to begin to take responsibility for climate change. As we have seen, the developed nations had agreed in the UNFCCC that they should take the lead in reducing the threat of climate change because they were mostly responsible for the build up of ghg in the atmosphere and Kyoto was understood to be a modest initial step toward a global solution. That is, Kyoto negotiators understood that a global solution would be negotiated later in future meetings of the UNFCCC parties. From the standpoint of some the most vulnerable countries,including some of the small island developing states making up the organization AOSIS, Kyoto was not aggressive enough to prevent climate change threats to them. At the COP-13 negotiations in Bali, Indonesia in 2007, parties to the UNFCCC agreed to replace the Kyoto Protocol with an agreement that would create a second commitment period under the UNFCCC and would include binding emissions reductions for developed countries and new programs on adaptation for developing countries, deforestation, finance, technology transfer, and capacity building. This agreement was referred to as the Bali Roadmap, which also called for articulating a “shared vision for long-term cooperative action,” including a long-term global goal for emission reductions. The original UNFCCC climate treaty had neither a quantified temperature limitation goal nor a ghg concentration atmospheric stabilization goal. In the Bali Roadmap the international community agreed to work on such a goal. The Bali decision also recognized that developing countries could make contributions to solving the climate change through the development of Nationally Appropriate Mitigation Actions (NAMAs), meaning climate change strategies for developing countries. The NAMAs, however, would not constitute binding emissions reduction requirements for developing countries in contrast to the binding obligations of developed countries in the Kyoto Protocol that would be further developed and extended in Copenhagen. Although some progress was made on a few issues in the two-year lead-up to Copenhagen, little progress was made on the major issues needed to define a global solution for climate change and particularly on legal commitments for GHG emissions reductions and funding for adaptation, deforestation programs, and technology transfer. As Copenhagen approached, optimism about a Copenhagen deal faded although there was a short spurt of renewed hope several weeks before the conference started in December 2009 as the US, China, and a few other nations publicly made non-binding commitments on emissions reductions. During the Copenhagen conference representatives from poor vulnerable nations begged developed countries to: (a) commit to reduce GHG emissions to levels necessary to prevent dangerous climate change;and (b) to fund adaptation programs in developing countries that are necessary to protect the most vulnerable from climate change impacts that could be avoided or compensate for the damages that could not be avoided. Despite these pleas, not much happened during the Copenhagen conference to resolve the most contentious issues until US President Obama appeared on the morning of the last day, Friday, December 18, 2009. For much of that day, President Obama negotiated with Chinese premier Wen Jiabao, Brazilian president Luiz Inacio Lula da Silva, Indian Prime Minister Manmohan Singh and South African President Jacob Zuma. (Lerer, 2009) Yet, a large part of this time was focused on a dispute between the United States and China on whether China would agree to monitoring and verification of Chinese climate change commitments. President Obama could not commit to anything in Copenhagen that he knew he could not get through the US congress. Because a climate change bill that had passed the US House of Representatives was very weak compared to what science said was necessary to protect the world’s poorest people, the United States took a position in the lead-up to Copenhagen that continued to be the weakest of all the developed countries’ commitments on emissions reductions. The US could only commit to a 13% reduction below 2005, a 4% reduction below 1990 levels. Yet most scientists were asserting that the world needed to reduce ghg emissions by 25% to 40% reductions below 1990 levels to have any confidence that the international community would limit warming to 20 C, a level which was widely believed to trigger dangerous climate change. Because none of the developed countries were willing to make emissions reduction commitments congruent with what scientific community said was necessary to protect them, some of the most vulnerable developing countries saw the developed countries’ positions in Copenhagen as ominous, perhaps a death sentence. President Obama personally negotiated the Copenhagen Accord during last hours of the conference. Yet, to get this deal, President Obama had to ignore many of the positions of the most vulnerable nations that were unresolved in the two negotiating documents that had been created in the lead-up to Copenhagen over two years. That is, for instance, among other things, the Copenhagen Accord failed to get commitments from the United States and some other developed countries to reduce ghg emissions at levels necessary to prevent serious climate change damage. President Obama managed to get fairly wide spread support for the Copenhagen Accord on the last day of the Copenhagen negotiations despite the fact that the United States was not able to commit to emissions reductions at levels to prevent dangerous climate change. Politically President Obama’s hands were tied in regard to his ability to commit to issues of interest to those nations most vulnerable to climate change because of domestic political constraints. Before Copenhagen, the US House of Representatives had passed a bill requiring a 17 percent reduction below 2005 levels by 2020 and this was a practical limitation on what the United States could commit to in international negotiations. For domestic political reasons, the US President also wanted agreement from China and other large developing countries on transparent procedures for verifying their non-binding emissions reduction commitments. Those opposing climate change legislation in the United States often have argued that it would be unfair to the United States if it was bound to reduce GHG emissions and China was not required to do the same. In fact, a decade earlier, when the Kyoto Accord was under consideration in the United States, opponents of the Kyoto deal frequently ran TV commercials that argued that the Kyoto Protocol was unfair to the United States because China was excluded from emissions limitations. This argument was often made without e critical comment in the United States even though the United States had committed itself to take the first steps to reduce emissions along wAlthough President Obama originally negotiated the Copenhagen Accord with just four other countries, in the last few hours of the Copenhagen conference the United States successfully convinced most large emitting countries to support the Accord.